One of my friends posted an amazing looking low carb pasta dish about a month ago. I know "low carb" and "pasta" together used to be an oxymoron, but that is not the case anymore. There are tons of options out there for "pasta" vegetables. I have tried spaghetti squash and while I like it, it is a time consuming process and my Husband will not eat it. There is also the issue of the squash being different sizes which makes it all but impossible to cook perfect every time. The recipe my friend used called for a new (to me) spiraling device to make the pasta out of zucchini. I immediately wanted one. What followed next was a lot of searching and frustration on Amazon. I did not want a HUGE spiraling device that was going to take up counter or cabinet space. I did not want a cheap and small handheld device that did not work and killed my wrists. I didn't know it at the time, but what I wanted was a Super Swizz. I will admit that I was a little skeptical of a smaller device like the Super Swizz. However, I was amazed when I used it. It was SO easy and quick too. I did chop off the ends of my zucchini before putting it in the Super Swizz, but I found out that was not necessary. All you really need to do is clean your vegetables. 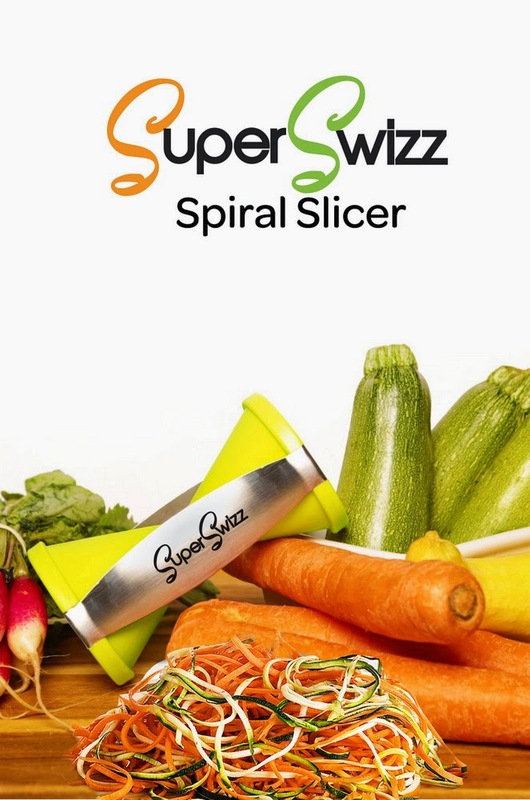 The Super Swizz works best on firm vegetables like carrots, zucchini, potatoes, squash, etc. You basically just stick the end of the vegetable into the Super Swizz. Hold the Super Swizz still with one hand and turn your vegetable in a circle with the other hand. Viola. Vegetable "spaghetti" starts coming out. It is reminiscent of a pencil sharpener..only easier to use. This easy dish only has five ingredients! It is fresh, healthy, low carb and delicious. My only complaint was that I didn't make more. My Husband even loved it and said that he would eat it regularly. Win. Spiral all the zucchini. Chop the tomato. Use kitchen scissors or a knife to cut uncooked bacon into small slices (approximately 1/3 inch). Cook bacon in skillet. 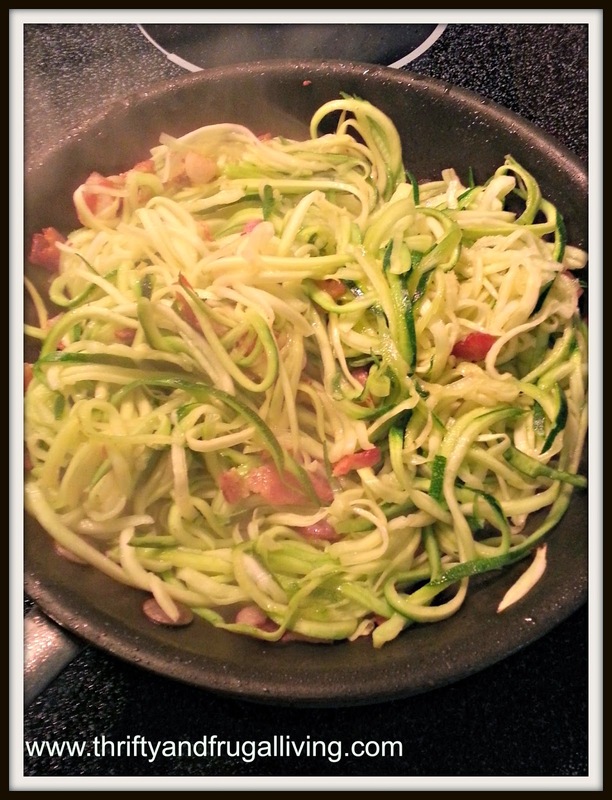 Once bacon is cooked, add zucchini spirals. Mix and cook for about 3-4 minutes until zucchini is softened. Strain if necessary. 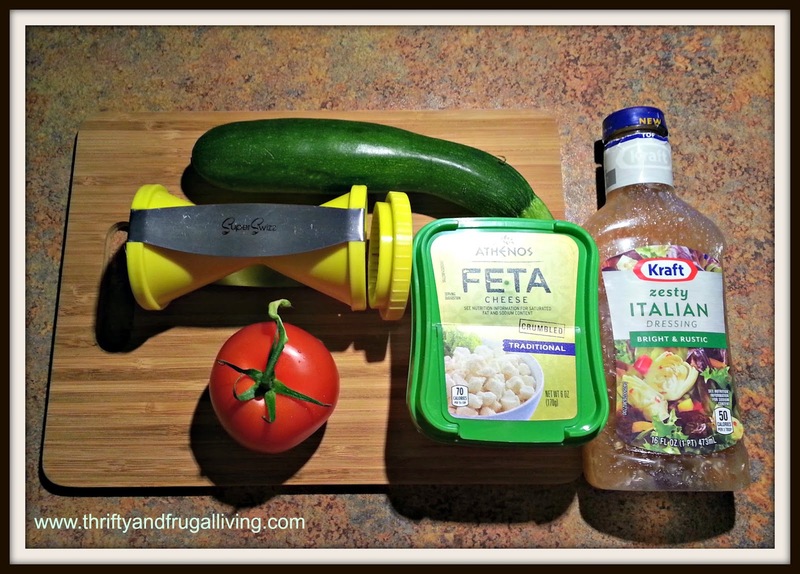 Add to bowl(s) and top with sliced tomato, Feta and Italian dressing to taste. Sounds yummy, doesn't it? It was so good that I told my Husband we are stopping by the store to pick up some more zucchini and I am making another larger batch this week. I should note that zucchini cooks down a lot. It may seem like you have too much when it is raw, but there will be less when it is cooked in the skillet for a few minutes. The Super Swizz was easy to clean afterward alsos. It comes with a small cleaning brush that gets all of the leftover vegetables out of the center of the device and helps to clean the blades. Since it is dishwasher safe, I really just rinsed it and tossed it in the dishwasher. So easy. I am in love with my Super Swizz and I would definite recommend it. I already have a ton of ideas on things that I can make with it. I'm excited to make some string potato fries and some carrot muffins next. What would you make if you had a Super Swizz? I love love love my spiralizer that I have! You know I love "zoodles"...my new fave is cucumber for salads! Yum! That recipe looks so good! 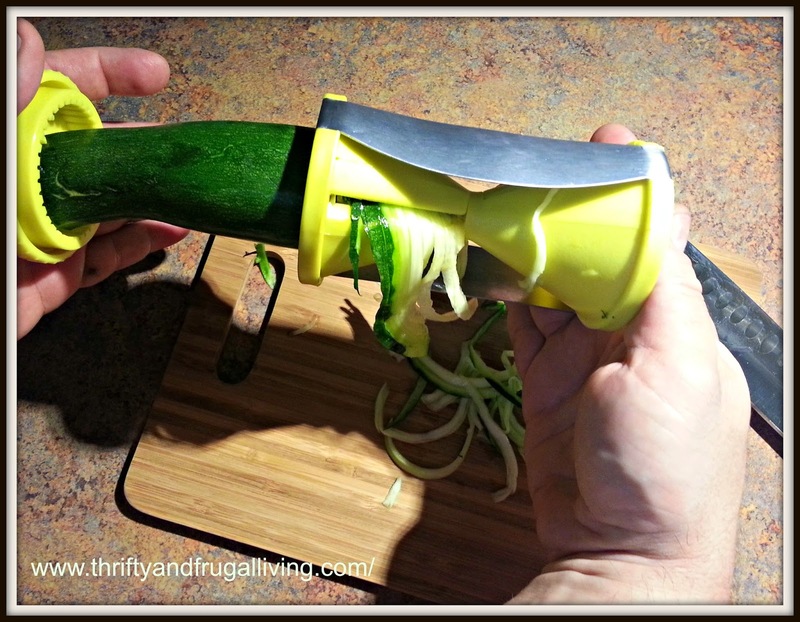 I need to get my hand on a spiralizer. I will check out the Super Swizz. What a fun name! 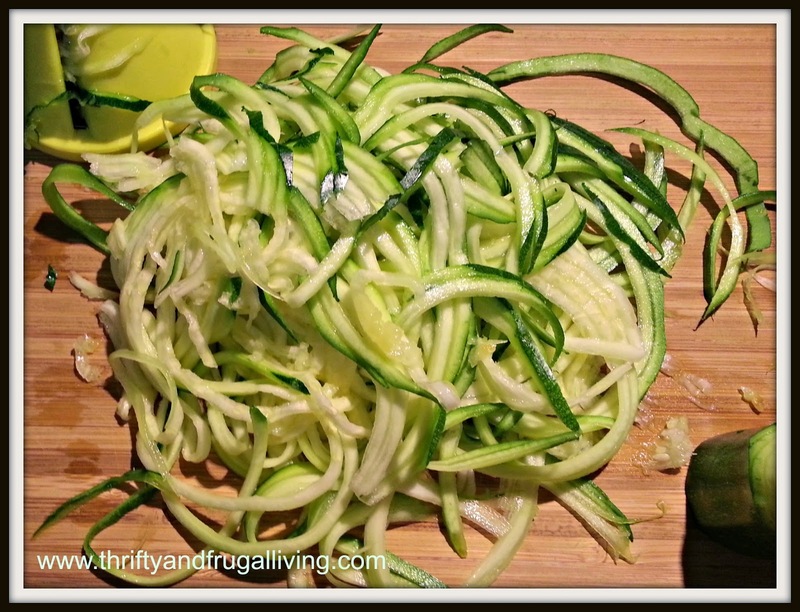 Love this recipe and I need a spiralizer! I try to eat as clean as I can and replace pasta with zucchini or spaghetti squash! Oh my goodness...this sounds so incredible. Thank you for sharing the recipe. I am not into these gadgets, but I admit that these are great for low carb diets. Oh yes! I would love to have one of these! Zucchini noodles sound awesome! Yum! 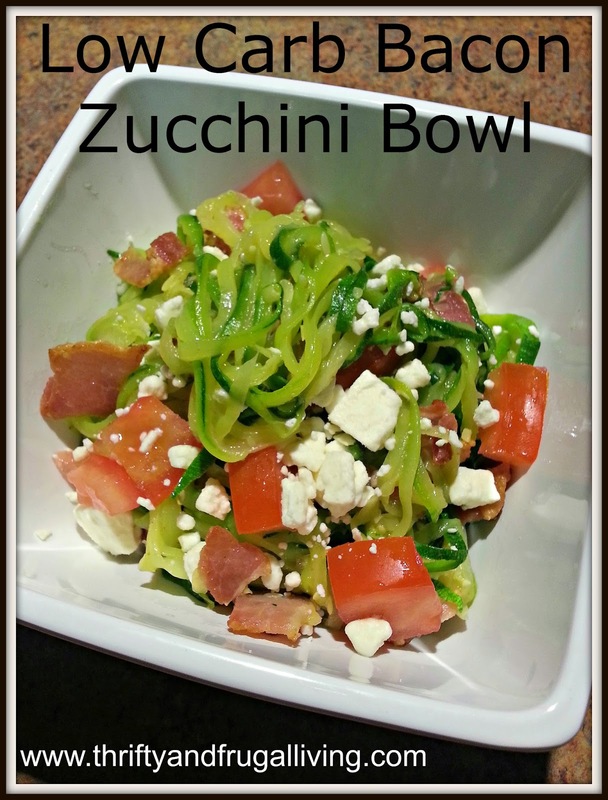 I've always wanted to try Zucchini noodles and low carb is always good! Looks delicious!